Little known fact, the National Film Board (NFB) offers group activities for children (aged 7 and up) and their parents to learn the basics of animation. Last week, my daughter and I made our way down to the NFB at De Maisonneuve and St-Denis to take part in a two-hour workshop on cut-out animation. For those of you unfamiliar with cut-out, just think South Park. 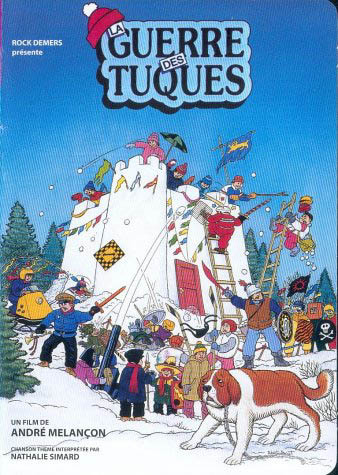 The theme of this session was Guerre des tuques, a film by Roger Cantin et Danyèle Patenaude. We were given some instruction ahead of time, specifically about breaking down movement. An important concept: it takes 24 frames to make 1 second of film. In groups of four, we had to think of a very short segment related to our theme, draw a four-framed storyboard, and then make our own cut-out characters. In the studio, two oil painting backdrops were supplied for filming. The photo in the top left is one of the backdrops we used, minus the props and clay characters. The process for filming a short sequence is much longer than one might think, and strangely enough, my seven-year-old caught on much more quickly than I did. My husband says that some people just have an innate sense of how to break down movement. The cost of the workshop was $7 for adults and $5 for children. In addition, you have an hour of free viewing in the CinéRobothèque before the class starts. This is an enjoyable way to spend a Sunday afternoon with your kids. Below is the fruit of our cut-out labours. The NFB also holds clay animation and a recycling-animation workshops. : NFB: Learn the ABCs of AnimationTweet this!